The small, lightweight (2.5 lbs) package travels very easily, making it ideal for bringing on trips or just going out to a remote location where lugging around a big telescope may be inconvenient or impossible. It doesn’t come with everything. You will need a few more accessories. However, if you’re already into photography, there’s a good chance you already have some or all of this on hand. A sturdy tripod with a 3/8″ mount. (A screw thread adapter will be needed if you have a 1/4″ mount). A standard camera ball head to attach your camera to the SkyTracker. optional iOptron app for iOS ($1 iTunes App Store) or 3rd party app for Android ($1 Google Play) to find the proper position of the alignment stars. The illuminated polar scope is actually a very nice piece. It has dual focus controls – 1 for the dial markings in the reticle, and one for the objective lens. This second focus setting is secured in place with a locking ring while the reticle side focus remains adjustable. The polar score is illuminated from a red LED within the SkyTracker unit rather than being self-powered. The dial is easily visible and not too bright. It has FOV of about 2º. The brightness level is just nice so that you can see the dial markings without washing out the stars. SkyTracker also comes with a nylon carrying case. The SkyTracker fits in very snugly making it a bit of a struggle to get it in and out. One poor choice in was putting the pouch to store the polar scope on the inside wall of the carry case. It makes the fit of the SkyTracker in the case even tighter causing a huge bulge in the side. This could also make the scope prone to damage should the bag take a hit or a fall. Setup of the SkyTracker is very straightforward. Like with any EQ mount, having a level mount and good polar alignment are key. Getting the tripod well leveled is essential. Once it’s level, point the unit towards the north (the built-in compass can assist if you’re setting up in daylight at an unfamiliar site) and get Polaris in the alignment scope using the azimuth and latitude adjustments. I managed to get the mount perfectly aligned in a matter of under 5 minutes my first time out. Both azimuth and latitude adjustments are locking. Azimuth adjustment is done by turning the unit side to side on its base. Latitude is set with an adjustable thumb screw. It makes aligning to Polaris (or Sigma Octantis in the southern hemisphere) very quick and easy. Get it aligned, lock all the locking screws tight, and you’re good to go. Centering Polaris will give you an alignment that’s good enough for short exposures or short focal lengths. If you want to go longer, you’ll need to align it with Polaris correctly offset from center. To aid in this, you can get the iOptron app for iOS from the iTunes App Store for $1. If you have an Android device, a third party app is available from the Google Play Store, also for $1. Using this and your device’s GPS, the app will show you where on the dial that Polaris or Sigma Octantis should be located for accurate polar alignment. While you can calculate these positions manually, the app gives you an instant visual representation and is worthwhile getting, even though you have to buy it separately. One issue I encountered in setup is that tightening the locking screws for latitude and azimuth adjustments usually results in the alignment shifting from where you have it set. This will be enough of a shift to cause trailing. Properly aligning the unit requires a little compensating for when making the adjustments and locking the axes to ensure you have perfect alignment once the locks are tightened. Having a good, sturdy tripod is recommended for maximum stability, but it performs fairly well on more run of the mill lightweight tripods. I found that you’ll want to polar align SkyTracker with the camera already mounted to because the weight difference will have an effect on the polar alignment. I’m not sure if this is because of the SkyTracker build or because of my tripod at this point. Once aligned, you’re good to go. Pick a target, point the camera it it using the ball head, lock it down, and turn on the SkyTracker. You can then trigger your shots using whatever remote control device you normally use. That’s really all there is to it. SkyTracker also has a ½ speed function. This allows you to use it for landscape astrophotography. Using this function, you can get longer exposure times on the sky with minimal star trailing while only slightly blurring the landscape. I haven’t tried this yet, but plan to once I can get out to a suitable location. 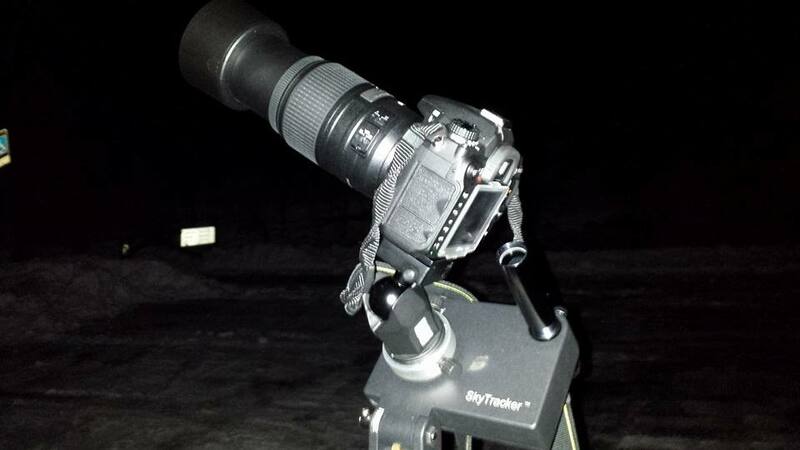 So far, I’ve only used the SkyTracker with 30 second exposures using my 55-300mm at 300mm. My 2 primary targets for the evening were M45 – the Pleiades Cluster and M42 Orion Nebula. Tracking was flawless for these exposures. At 300mm, my targets stayed centered in the camera’s field with minimal drift over the length of the time I spent on each target (about 1 hour each). This made for some great shots with round stars and no signs of trailing whatsoever. Since I’m still waiting to receive my remote shutter control that can do bulb mode, I wasn’t able to try exposures longer than 30 seconds on my first time out. I’ll be testing for longer exposure times at a future date and will update this review accordingly. You can see the 2 resulting images below. Stars are sharp with no signs of trails. Supports up to 7.7 lbs (3.5 kg) so you can fit cameras with some hefty lenses. At $400US for the unit, you’d figure they could actually give you the app to help align it for free rather than charging for it, even though it’s only $1. To me, it’s an essential part of using the SkyTracker to its full potential. Don’t feel like lugging out that big, heavy scope and taking 30+ minutes to set it up to do some piggyback photography? Well you can be up and running with pretty much the same results with SkyTracker in about 5 minutes. If you need to be able to have a small, lightweight setup that you can take with you anywhere or just be able to set up quickly to take a few shots every now and then, the SkyTracker is a great choice. It’s easy to use, its tracking is excellent, and it makes setup and teardown painless. You’ll be hard pressed to find a tracker this accurate in a package this complete for such an affordable price.